It was three years ago today that I first started working on WarLight. WarLight has come a long ways in three years, but I hope for it to go even further in the next three! Author FizzerPosted on February 28, 2011 December 19, 2014 Tags Non-technical5 Comments on WarLight turns three! WarLight will be going down on Saturday, February 26th at 2pm PST (10pm GMT) for up to 30 minutes. Please plan accordingly for any fast games or single player games that may get interrupted during this 30-minute window. During this time, WarLight will be upgraded to v1.00.3. Once the deployment is complete, you can view all of the changes on the Change History page, but this blog post also gives a good summary. Markdown is a popular syntax for allowing more flexibility in forum posts than just plain text. After this release, the WarLight forum will allow you to include bold, italics, different font sizes, clickable links, and even in-line images in your forum posts. This will be applied retro-actively to all existing forum posts, so all links that exist in posts today will automatically become clickable. Once the system is live, I will make a forum post in the General forum describing how to use the special features. The Strategic 1v1 template (and therefore the ladder games) will have their luck reduced from 18% to 16%. This value is chosen since 4 armies attacking 2 armies will never fail at 16%. At 18%, the odds are 99.91%. The ladder rating system is getting a few minor tweaks. First off, ratings for new players will start at 0 instead of 1500. This doesn’t really affect much other than initial matches and mentality, but I felt this is necessary to reinforce the point that the current rating system does not start you at 1500 and raise/lower your rating based on your wins and losses. This is entirely my fault, since I presented the rating system this way, which was a mistake. The Bayesian rating system rates you as best it can with the available information – the idea that you start at 1500 is just plain wrong and should never have been introduced. Second, the game creation algorithm has been tweaked. The main goals behind this algorithm are to try and match you with players that will get you fun games, while also putting an emphasis on playing new players so there aren’t a lot of repeat matches, while also not stagnating your games if you get stuck waiting on a few busy/slow people. The ladder is settling down and pretty soon we will have what I consider an “established ladder.” The experience of a new player joining into an established ladder is important. With this new algorithm, the idea is that a new player will start at the bottom and work their way up. As they keep winning, the ladder will jump them further and further up the ladder until their win rate stats to stagnate and they find their final position. The Bayesian algorithm is perfect for this kind of system, since a strong player working their way up the ladder won’t penalize the players they beat on their way up much, since those player’s ratings will re-calculate dynamically based on the new player’s final resting place. Third, the Best Rating column has been tweaked. This column remembers the highest rating you have ever achieved. It’s getting a partner, Best Rank, which will act similarly. However, both of these fields will now only be recorded once you’ve exited the provisional period. This prevents the early fluctuations from awarding a higher Best Rating than was really earned. Also, the Best Rating column has been hidden from the main ladder page just to keep things more tidy. You can still view the value by clicking on a player’s name. The existing Best Rating for everyone will be reset. Finally, the game creation algorithm has also been improved so it’s possible to receive more than one game per ladder update. This doesn’t guarantee you that it will create every match possible, but it’s a step in the right direction. More work still may be coming in a later release to make it full up all available matches. In the previous update (1.00.2), map creators were allowed to invite past the 6-player limit when creating games on their own map. This has been improved even more, and now map creators can use all of the member-only game-creation features when creating games with their own map. This means they can use custom scenarios in multi-player and also specify any luck percentage for their games. You can now click on the maps on the Dashboard to preview them. Further, a “Show all” link below the new maps was added that takes you to a new page that lets you browse all public maps. Similarly, the Recent Forum Posts section grew a “Show all” link. This link takes you to a new page that lets you view all new posts across all forums at once. – Player’s profiles now link to their corresponding ladder page. – After clicking “Show all” next to a list of ladder games, the ratings of each participant now show up in a new column. – The 2v2 auto game is now fixed teams instead of random. – The Reconnaissance card now moves the camera to the spot it was played on. – Blacklisted players are no longer auto-added to your invite list via the auto-add system. – The ladder now highlights the player being viewed, or yourself on the main ladder page. 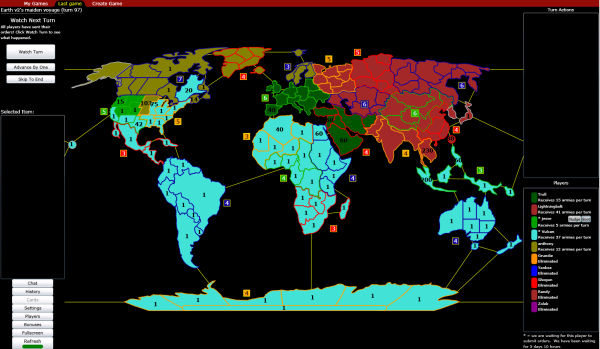 – Updated the Variants page with three new variants: Juggernaut, real locations, and Chinese Checkers. – Fixed a bug that prevented auto boot from working in games that involved AIs. – Fixed a bug that would sometimes cause a Force Join to fail when a player did not have an automatic color. – Fixed a bug that was preventing the member icon from showing up in the lobby. – In the Tournament Settings window, the tournament settings were moved from the right to the left side to make it more balanced. – Deleting a testing map now deletes any templates that were assigned to that map instead of causing an error. – Fixed a bug that caused distributing games to appear at the bottom of a list of ladder games. – Fixed a bug that was limiting the number of people that could be invited to tournaments too strictly. Today’s update contains a few small enhancements and small bugfixes, mostly pertaining to the ladder. Players with fewer than 10 completed ladder games are no longer awarded a rank. This means that you need to finish 10 games before you’ll appear on the scoreboard. You can still tell where you would have ranked by examining your rating compared to others, but you won’t officially get it until you complete ten games. This is necessary due to the rating algorithm used by WarLight. The algorithm performs very poorly with small amounts of data. If WarLight ever switches rating algorithms, this restriction can be removed or changed, but for now this makes sense. This makes sense not only for the launch of the ladder, but new players joining the ladder since they would suffer the same problem. The ladder now updates every 2 hours instead of every 6. The speed may need to be tweaked again in the future, but right now the server can handle doing it every other hour. Any map creators that aren’t members can now invite any number of players to games that they create using their own maps. This is in response to non-members who were working on big maps and would like to continue development. – Increased games and players per ladder page from 20 to 50. – Tweaked the ladder game creation algorithm slightly – it sorts initially by rating instead of rank. – Fixed a bug that was causing the ladder to set up duplicate games. – Fixed the broken link in ladder e-mails. – Added the “offset” command into BayeseloLog.txt, making it so you don’t have to mentally add 1500 to scores. – When looking at a person’s ladder games, the order is now reversed so newest games appear on top. – Ladder games that have just begun now list the date they were created instead of blank. Maximum number of invites by non-members has been raised to 6! Due to popular demand, free WarLight players can now invite 6 players to a game. This enables 3 v 3 games, as well as 2 v 2 v 2 matches. Please note that 6 invites includes yourself, so this means you can invite a maximum of 5 friends plus yourself. – Raised the invite limit for non-members from 5 to 6. – Moved “Newest maps” on the Dashboard to the right column. – The 2v2 auto game and the Strategic 2v2 templates are now actually 2v2 instead of FFA. – Ladder pages no longer show games still in the lobby as have moved on year 0001. – Fixed many pages on Chrome so they no longer stretch to 100% width. – Recent ladder games on the dashboard page now sort correctly. – Fixed the rank that appears for contender 2 in a ladder game’s description. – The ladder keeps a log of bayeselo commands located at Data/BayeseloLog.txt. This will be explained in the next blog post. Author FizzerPosted on February 20, 2011 March 10, 2011 Tags Non-technical3 Comments on Maximum number of invites by non-members has been raised to 6! After almost three years in development, WarLight will shed it’s beta tag and launch 1.0! WarLight will be going down on Saturday, February 19th at 1am PST (9am GMT) for up to two hours. Please plan accordingly for any fast games or single player games that may get interrupted during this 2-hour window. During this time, WarLight will be upgraded to v1.00.0. Once the deployment is complete, you can view all of the changes on the Change History page. Just because it’s being called 1.0 does not mean that I’m done working on WarLight. This is just a milestone – I have no plans of moving on to a new game. To further reinforce this, the company that will own WarLight has been named WarLight, LLC. The Ladder: The WarLight ladder is a ELO-based ranking system where players compete for the top spot on the ladder. Initially a 1 v 1 ladder will be available, with more coming later. Automatic Booting: A third boot timer, next to the direct-boot and vote-to-boot timers will be made available to game creators. When players reach this time, WarLight will boot players that aren’t playing from games automatically, without requiring any player having to click the boot button. 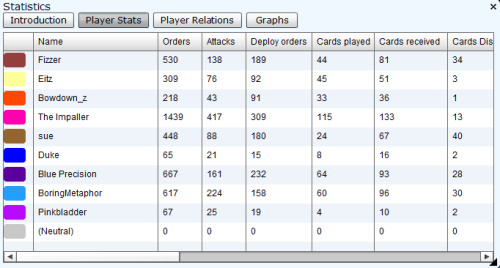 The Statistics Window: The current “graphs” window is being absorbed into the new statistics window, which provides a variety of interesting information about your WarLight games. The Dashboard: The dashboard gives an overview of the latest things that have been happening around WarLight, including new maps, forum posts, blog posts, etc. Membership System: WarLight is adopting a freemium-style membership system. While I love free things, it�s obvious that WarLight cannot continue forever without bringing in revenue to keep the servers online. WarLight will adopt a “freemium” model, which is just the latest term for having a free service alongside a premium paid mode that offers more features or a better experience. WarLight will sell lifetime memberships which give access to features of the site that the more hard-core players tend to want to use, such as ladders and the statistics window. Many of the features restricted to members only apply to game creation. This means that a member can create a game using the cool member-only features and invite all of their non-member friends to a game. This is designed so that, within a group of friends that play WarLight, only one person needs to become a member to allow all of their friends to enjoy many of the member benefits. Rest assured, WarLight will always be free to play! WarLight membership just gives you access to more features. It’s tough to decide between a one-time or a reoccurring fee for a site like WarLight because it has a high cost-per-user in hosting fees. Everyone likes one-time fees, and it would certainly generate more sales, but the trouble with one-time fees are that players who play for a long time eventually end up costing more than they originally paid in. Most of the sites similar to WarLight all have reoccurring fees. In the end, I’ve decided to launch WarLight as a one-time fee. However, it may change to a reoccurring fee in the future — but of course, anyone who purchases now is buying a lifetime membership which will never expire. The reoccurring fee would only apply to those who purchase after the switch. This will help grow WarLight faster, and it also serves as a thank-you for everyone who helped test during beta. Don’t miss this opportunity! The biggest feature coming in 1.0 is of course the ladder, as covered in the previous two blog posts. But there are more goodies coming as well! This was mentioned in the previous blog post, but it deserves its own section. This is a third boot timer, next to the vote-to-boot time and the direct-boot time, that game creators can specify. When the auto boot time is reached, WarLight will automatically boot any players that have not taken their turn, without requiring anyone to press the boot button. The newest maps that have been created. Recent forum posts across all forums. Recent posts to this blog. This makes it easy to check on recent events without visiting each individual section. The existing graphs window will be absorbed into the new statistics window, which will show a variety of interesting statistics about the game. The statistics window will only be available for WarLight members. 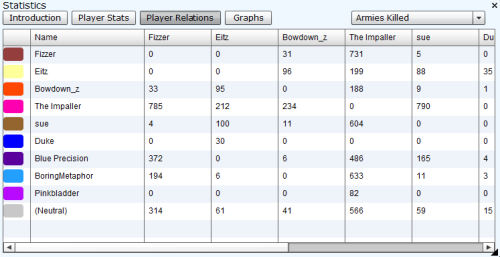 In addition to the graphs that currently exist, it adds two new sections: relations between players, and player statistics. The “relations” tab shows how much each player has fought with other players. It’s great for determining who has been fighting who. The number of A’s armies killed in fights between player A and B. The number of A’s armies killed in A’s attacks against B. The number of B’s armies killed in A’s attacks against B. The number of armies that A defended with against B’s attacks. The number of armies that A attacked with against B. In the real game, you can hover your mouse over a cell to show a description of what that cell represents. This makes it easy to understand what the numbers mean. The player stats tab shows a variety of statistics about each player. Total number of orders issued. Total number of attacks issued. Total number of deployments issued. Total number of cards played. Total number of cards received. Total number of cards discarded. Total number of failed attacks. Total number of armies attacked with. Total number of armies lost by attacking. Total number of armies transfers. Total number of armies deployed. Total number of times attacked. Total number of armies that attacked this player. Total number of armies lost while defending. I want to hear about any more statistics you’d like to see. I plan to add more in subsequent releases – let the brainstorming begin! Sort Tournament Players: When inviting players to a tournament or forwarding a tournament invite, the players list can now be sorted. Performance Enhancements: Many areas of the site have been worked on for performance, and will load much more quickly. Particularly the My Games page has been sped up a lot, and the page that lets you invite players to a game will also load much more quickly. Force Join: The Force Join system has been de-coupled from nudge, and is now a first class citizen. This just means it’ll work more reliably. Players will be force-joinable in any tournament or ladder game once they’ve reached the direct boot timer without joining a game. Members-only open seat prerequisite: Ability to restrict the open seats in your games to WarLight members only. Be sure to read Part 1 if you haven’t. Part 2 continues to discuss some of the more nitty-gritty details of how the WarLight ladders will work at launch. WarLight 1.0 will bring a new feature: Automatic booting. This is a third boot timer, next to the vote-to-boot time and the direct-boot time, that game creators can specify. When the auto boot timer is reached, WarLight will automatically boot any players that have not taken their turn, without requiring anyone to press the boot button. Automatic booting will be enabled for all ladder games at the 72 hours (3 days) mark. This is bound to be a controversial topic, but let’s first make sure we understand the benefits of this. The main reason for automatic booting is that it keeps the ladder fair and balanced for all players. If booting was manual, players who eagerly boot whenever possible would, over time, have a ratings advantage over players who were more courteous with their boot button. By making booting automatic, this takes booting out of the equation and makes it fair for all players. Another reason for automatic booting is that it ensures the ladder as a whole keeps moving. It’s not uncommon in WarLight for players to procrastinate games – I’ve seen some 1 v 1 games that got stuck for exceptionally long time periods (sometimes even over 100 days). These aren’t just because players quit WarLight, but rather they avoid playing specific games. Even when boot times are enabled, often players feel like they should not boot out of honor or kindness. These kind of delays really cause problems in a ladder. There could be several people waiting to play with a stuck opponent. This also opens up exploits where high ranking players can keep themselves busy in a stuck game, preventing them from having to defend their rank. Automatic booting solves all of these, but has other disadvantages. If you know you’re going to be away from WarLight for more than 3 days, you’ll need to depart the ladder before you leave. I realize this is an imperfect solution, and I plan to improve this in a subsequent release. Three months after a ladder game finishes, it will expire. Although they are still visible on the website for historical reasons, expired games no longer count towards your ratings. This is done for a couple reasons. ELO is a zero-sum system, meaning each rating point that is lost by one player is gained by another. However, when a new player joins the ladder, they bring 1500 new rating points into the mix. If someone joins, loses a few games, and quits, they just deposited a few ratings points onto other players who may end up never leaving the ladder. On a small scale this process is not a problem, but over long periods of time it causes ratings inflation. This makes it difficult to compare the true skill over someone who gets an early high rating versus someone who gets a high rating at some point in the future. It also can create further gaps between the players on either end of the ladder. Wikipedia has a good explanation of ratings inflation here. Not only will game expiration eliminate inflation, it will also help reflect changing skill levels. Most players will get better over time, and game expiration will ensure that your skill changes are reflected in your rating. This also is yet another thing ensuring that high-ranking players need to actively defend their ratings. The strategic 1 v 1 settings have been designed to take most of the luck commonly found in WarLight games out of the mix. The luck percentage is set very low, manual distribution means you can choose where you start, and the initial map layouts are mixed up enough to ensure that the best starting locations are rarely obvious. Just like any manual distribution game, ladder games will have an initial territory distribution phase where both players choose which territories they’d like to start with. Picking where you start is very significant for determining how the rest of the game plays out. Sometimes, there’s an unfortunate and unavoidable situation – both players pick the same territory as their #1 pick. WarLight’s behavior, as usual, is to give out the territory to a random player. Their opponent is compensated by getting their #2 and #3 picks, but often it’s still not as good as getting their #1. I like to compare this to Chess, which is well-known for having an advantage to the player playing the white pieces. Some Chess ELO systems give a slight ratings advantage to players playing white, under the assumption that this will help rank those players closer to their true skill. WarLight will follow a similar model, giving a slight ratings advantage to players who get first pick. It won’t be a very big advantage – less than a third as big as Chess’s advantage. After the ladder has been live for a few months, I plan to do an analysis of every ladder game to get a better idea of how often the player with first pick truly wins and will adjust the ratings advantage to match the real-world results. This post describes how the ladder will work at launch. Everything is subject to change – if you’re reading this in the future, be sure and check the Help tab for up-to-date rules on how everything works now. The WarLight 1.0 release will bring us the WarLight 1 v 1 Ladder. A 2 v 2 ladder will probably come in a subsequent release, and potentially a 3 v 3, FFA or other types of ladders coming after that based on demand. Ladders are competitive arenas where players compete for the highest spot on the ladder. In the 1 v 1 ladder, players who participate in the ladder are matched against each other in heads-up duels to the death. The ladders will use an ELO rating system, similar to what is used in professional Chess tournaments, to rank players by their skill level. “Ladder” may not be a perfect name, since often ladder indicates a system where you swap positions with your opponent. But for lack of a better term, we’ll run with this for now. If you’re not familiar with ELO, I’ll give a basic introduction. Each player starts with a rating of 1500, which then goes up or down as they lose or win games. Each win exchanges some amount of rating points from the loser to the winner. This means ELO is a zero-sum rating system, meaning new points aren’t created or destroyed when a game is played. Beating a stronger opponent gives you more rating points than beating a weaker opponent. Simply ordering players by their rating will determine their rank, starting with #1 for the player with the highest rating, #2 for the second highest, and so on. The WarLight website will clearly show everyone’s rating and rank, and make it easy to view each ladder game as it finishes for those who like following along. There will also be a new forum for discussing ladder games. My favorite feature of the ladders is how your rating changes based on how your previous opponents ratings change. For example, if you beat someone who ends up becoming the #1 player, you get the full benefits of beating the #1 player, even if they weren’t #1 when you beat them. This also means your rating changes even when you’re not playing, since someone else’s game finishing can have a ripple effect. In the WarLight ladder, you don’t get to choose who you play against. Instead, the ladder sets up games for you. You can, however, pick the maximum number of games you’d like to be playing at any given time. When WarLight creates games, it will attempt to “walk you up the ladder” by creating games with players who are 15% higher than you on the ladder. However, it’s possible to get matched with someone higher or lower than that if the ideal positioned player is not available for a new game. The exact algorithm that WarLight uses for creating games will be documented on the ladder help page. Players are free to leave the ladder and re-join it at any time with no penalty. Leaving the ladder does not delete any on-going games, it just stops new games from being created for you. Your rating continues to be updated even when you’re not participating in the ladder. However, you will not receive a rank while not in the ladder and, therefore, won’t be included on the leaderboard. This is done to ensure high-ranking players have to actively defend their high ranks, and can’t just get into the #1 spot and squat on it. If you re-join the ladder, your existing rating will be used to rank you just as it was before you left. This makes it easy to take breaks in case you’re going to be away from WarLight for a while. Stay tuned for part two of this blog post, which will discuss how booting works in ladders, how the ladder will control ratings inflation, and the benefits of first pick. I frequently get asked what WarLight’s strategy is for generating revenue. So far, I’ve avoided giving an answer, mostly because I was still trying to figure it out. While I love free things, it’s obvious that WarLight cannot continue forever in its current situation. WarLight costs almost $300 per month just in hosting fees, and (unfortunately) I’m not nearly rich enough to afford this for the rest of my life. There are several different strategies that could work, let’s examine them here. One option is to rely strictly on donations to keep the site alive. This is similar to the Wikipedia model. Several people have already asked if they could donate to WarLight, but I’m not convinced this would work for WarLight long-term. Wikipedia barely gets by as it is, and WarLight has a significantly higher hosting cost per user than a site like Wikipedia, since most of Wikipedia’s traffic is static content which allows them to make heavy use of caching. WarLight has extremely high CPU and memory requirements compared to most sites, which is what makes it expensive to host. I also really think the kind souls that donate should get something in return for their money. If a site starts giving a reward for donating, then they’re just kidding themselves calling it a donation. What they’re really doing is selling the reward along with the good feelings that come with donating. Another option is to put ads on the site and use that revenue to keep it going. Targeted ads work great, as shown by Google’s business model. Unfortunately, WarLight’s audience is far too diverse to get any sort of decent ad targeting to work. Another form of advertising that works are the annoying ads. These are the ones that fly accross your screen, make noise, pop up, or force you to watch a video. These are all the rage these days in other Flash games, however I’m not a fan of these. Users hate them, and I would only consider this as a last resort. I really hope I never have to subject anyone to this. Unfortunately if you can’t target and you aren’t willing to use annoying ads, you’re looking at an extremely low revenue-per-user from advertising. These ads can still work if you’re a high traffic site serving “easy” content (static pages), but unfortunately WarLight is not. Some sites are set up to recieve small payments that enhance your gamimg experience. This is the Farmville and Evony model, where you can pay money to grow your farm/empire faster. Although WarLight could certainly sell things like additional armies, additional cards, more territories to pick or order priority, these would diminish the value and competitive spirit of the game. WarLight is fundamentally a competitive strategy game and I want players to win based on their strategy and not their wallet. Freemium is just the latest term for having a free service with a premium paid mode that offers more features or a better experience. In a freemium model, WarLight could offer premium features to paying players — things that the more hard-core WarLight players want. For example, WarLight could give premium users more control over their game settings or the ability to play in ladders, while still allowing free players to play the core game. For WarLight, this model makes a lot of sense since the players that like WarLight tend to really like WarLight. This is the model I have ultimately chosen for WarLight, which will launch with 1.0. Rest assured, WarLight will always be free to play. You can think of this as you would a retail game releasing a free demo, except “WarLight free” will never expire or limit how much you can play, it will only limit what features you can use.